With Letter Opener in Apple Mail, the worry is gone. Letter Opener Pro converts winmail.dat files on the fly, so you can actually see and use what the sender intended you to have. There's no fuss with Letter Opener Pro, no need to drag the winmail.dat file onto another application or call upon several programs to help you. 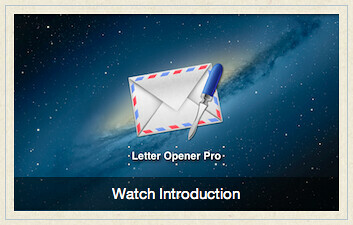 Once Letter Opener Pro is installed, you can forget about it. Mac OS X 10.8 Mountain Lion, 10.7 Lion or 10.6 Snow Leopard.